I can’t count the number of tweets or blog posts of Social Media marketers whining about their Facebook reach being too low. It’s kind of annoying, and I know it annoys Jon a lot. Well, you won’t have to annoy Jon anymore since your reach is back up! It started at the end of August 2012. Suddenly, Facebook page owners saw their page and post reach going down like crazy. Some of them even reported an 80% drop. That was big! Jon was one of the first bloggers to report this anomaly in September. Were they right to complain at that time? Absolutely! That drop was for real. On the following screenshot from our Facebook page Barometer, you can see the evidence of the drop. And that graph is the result of the average viral reach for more than 3,500 pages of all sizes. Pretty significant drop of viral reach at the end of August and beginning of September. 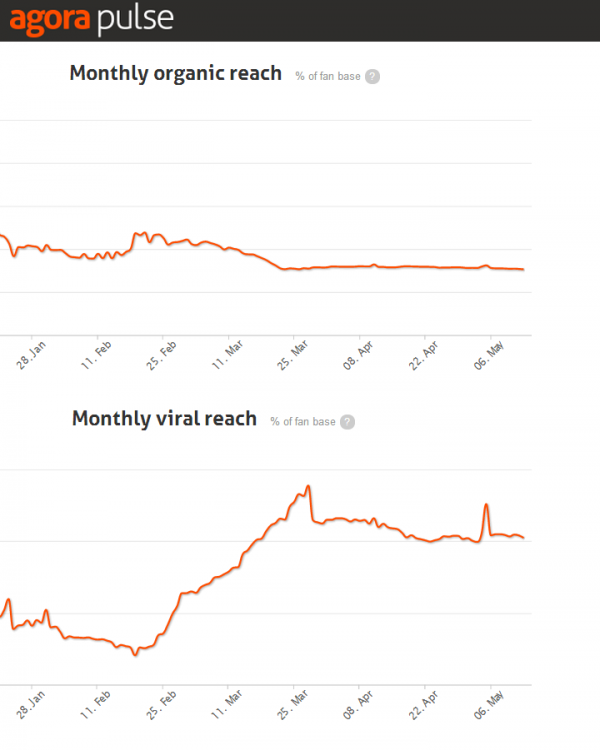 Weirdly enough, viral reach was the only metric affected; organic did not really change during that period. But as viral is a big part of total reach, total reach went down, too, as a result (simple math). That whole reach issue started to fill the Social Media blogosphere. According to some, it was a plot from Facebook to force page owners to pay to reach their fans. Jon wrote a detailed post about this issue, a good read I recommend you check out! Even TechCrunch was confused, posting conflicting articles confirming and denying the rumor within the same day! It’s been pretty hard for the rest of us to know where the real truth was. The truth was that actual reach was not down, but the way it was displayed was buggy! On February 22nd, Facebook announced a bug that had been affecting reach reporting in its page insights. Actual reach was not affected, but stats were inaccurately reporting lower numbers. So, thanks to that (not so) clear explanation from Facebook, the real question is whether or not your Facebook reach is really up. The short answer is yes. 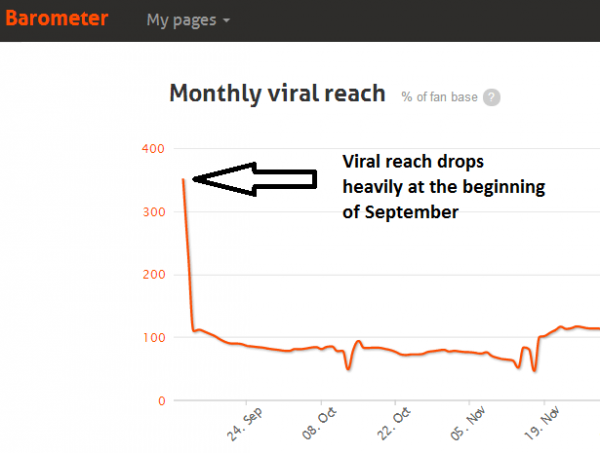 But the reach metric that has increased is not the organic one, but viral. Based on a sample of more than 3,000 pages of all sizes since February 21, organic reach has remained pretty steady while viral reach has increased by 200% on average. A pretty significant change. Since February 21, based on a sample of more than 3,500 pages, the monthly viral reach statistics have gone from the equivalent of 100% of fan bases to almost 300%. Organic has remained pretty steady. So, should you expect your organic reach to be the same, and your viral reach to have gone through the roof? Unfortunately, it is not that simple. The bug was only affecting certain types of impressions (for example, paid impressions in news feed or impressions of shared content); the effect of that bug fix on your page statistics will vary greatly depending on your content strategy, posting frequency and type of engagement you were getting. Based on the data we have for our biggest (and most active) clients, the impact on viral reach has gone anywhere from 100% to 1,000%! That means from twice to ten times as much viral reach. 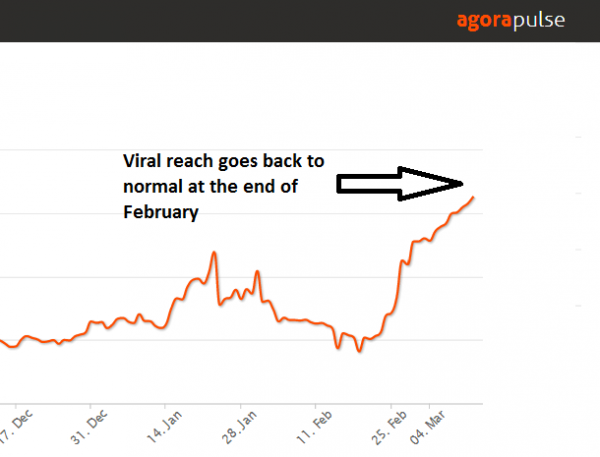 Viral being a big part of the total reach equation, total reach has been affected pro rata as a consequence. In a nutshell, the magnitude of the increase in reach will vary greatly from one page to another. But the good news is that the drop that everyone noticed at the beginning of September 2012 has been “erased” by the bug fix. Reach levels are now back to what they used to be in August 2012 and before. Want to find out how your page’s reach has been affected by this bug fix? Try our free Facebook Page Barometer. Let us know in the comments if you notice an increase in your organic or viral reach since the end of February. I’d love to know!